You may refuse to turn your air conditioner on before April, but it's never too early in the year for a paleta. Plus, what better way to celebrate the early onslaught of spring than with a cold treat? 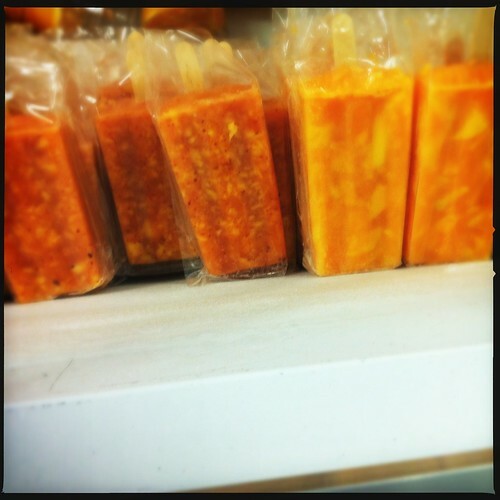 Paletas are Mexican popsicles. Texture-wise, they're just like regular popsicles, but the flavors are a little more dramatic than you'd find in an ice cream truck. Today, I had a bright pink pinenut paleta. It was cream-based and mildly sweet and nutty (it had little pinenuts mixed in). And because one paleta is never quite enough, I went back for a chili-mango one. I'm not sure how it works, but there's something about the combination of spicy chili and sweet tropical fruits that's absolutely wonderful. The first few bites are a little strange, but it gets a addictive quickly. La Michoacana is open year round. They serve ice cream, small Mexican dishes (nachos, elote) and paletas. Each paleta costs about $2, and there's no shame in going back for seconds. The rose petal is also awesome. I love this place! I'm trying to find out who they lease their space from? The surrounding area is such a mess and their landlord should be hounded to clean it up. It shouldn't be tolerated by proud memphians!